Chair’s night and who should we have as Guest speaker? None other than David Bailey, Yeah, you read me right. David Bailey. The David Bailey, you know, the one that used to work at Asda? One of those 164 David Bailey’s who were used by Samsung to promote the NX1000 back in 2012? Being David Bailey and a photographer has been of the occasional advantage, as David outlined, though any namesake can expect to spend a certain part of their waking day in disambiguation. Especially if, at least part of your day, involves doing the same thing. David’s theme was on the role of serendipity, the happy accident, which we have looked at as a result of the planned and the purposeful pursuit of the photograph. To be sure there were some very specific happen-stances along the way. Like the NX1000 campaign, where he got to meet the most famous of the David Bailey’s and the over the shoulder query on a London bound train, among others. In between there were long periods of learning. Each and every frame is a learning opportunity, if you have the mindset to turn it into one. Each and every frame is a unique fragment of time and geometry. Whether it is the one we were looking for …..
Bailey, as the 60’s trend for one named photographers labelled him, was, and is, by David’s account, a prodigious producer of frames, sometimes only he can see the difference in. There is a difference to be made here between the practised artist looking for what s/he knows is there and the amateur blindly firing off frames in the hope of hitting on something worth keeping. The camera becomes the instrument of discernment when it is in the hands of someone who can use it as a tool to pursue a clear idea relentlessly. The effect of a planned serendipity, the happy accident that comes from being the right person in the right place at the right time, often lies in the fact that the photographer kept on photographing those small differences until the story gelled with the one they had in mind. In this way photography is as much a process of revealing as constructing. Firstly: that which is just, or seems to be, random “Sheer dumb luck”. Secondly: chance from purposely acting towards a defined end running out of “Unluck”, you know the sort of thing, entering photos into competitions, getting feedback, putting that into action, where keeping doing things in search of something particular stirs up the creative pot. Thirdly: chance favouring the prepared mind (“Sagacity“), that is thinking like and acting purposefully as a photographer as opposed to a person with a camera bumping into photo ops. Fourthly: the sort that comes from being us, our actions, likes and dislikes, or as the great Victorian politician Benjamin Disraeli put it ” We make our fortunes and we call them fate”. (James Austin: Chase Chance and Creativity). In Austin’s words David was talking about “Chance interacting with creativity”, here through four evolutionary stages from spray and pray to an ingrained, experience and evidence based work flow. This is not exclusively about style. Style will evolve with practice and a critical eye and determine the way that the forces in the happy accident come together. It will also alter subtly over time. It is about persistence an open mind and the habit of looking, really looking, persistence and anticipation. And persistence. It has long been the case that as a brand you hire Bailey because he is Bailey. You get the Bailey style, the Bailey view. More likely you don’t as he doesn’t do commissions these days, but the point is this has taken decades to evolve and it didn’t happen by itself. And it is still happening. In the second half David moved to wedding photography as an example of a shoot closer to what the rest of us have a concept of, either as the photographer or the subject, major and/or minor, in illustrating chance interacting with creativity. There is a long list of “Must have” shots in the expectations of clients. These have grown over the years, farmed by fashion magazines, celebrity weddings, the “Wedding industry” as the costs, technicalities and expectations of the exceptional have grown. It is a journey through a very special day and it has a number of moments in it, actually built in it. Yes these will become the prompts for reminiscences, as will the things that went right and wrong, to other events that came before and after. As time passes photographs move from being a record to being a prompt for triggering those memories. So stiffed backed and formal are the traditional wedding shots that some of them look like they came off a production line and this in part, I suggest, became a driver for what, in some instances, have become full blown, multi-day, intercontinental celebrations. Yet, even if the day runs on the rails that the timetable of essential images suggests, there will be moments of interaction that make each part unique. Those angles, those interactions as things come together or go their separate ways, children/animals going off script, laughter, the unexpected glint of light from the bride’s father’s shotgun. HDR Imaging. What does it mean to you? Horrible Disastrous Rubbish? Highly Desirable Representation? Something in between? Our much welcome and returning speaker, David Southwell ARPS would admit that there is a lot of the former around but if done properly, High Dynamic Range images are an important tool in the photographers tool box. Most of his ARPS panel consisted of them taken in the demanding situation of the interior of Bristol Cathedral. Thoughts were certainly provoked and the discussion afterwards was more animated than usual which would suggest that this is a bit of a Marmite question, “Love, it hate it, you can’t ignore it” as per the advertising slogan. We will return to this later, for Marmite questions have a hidden truth within them. David did an excellent job of explaining the technical origins of HDR, essentially boosting the fixed capabilities of digital images to catch a range of 6 – 6.5 EV at best (depends on the sensor construction and other factors), or about one half that of the human eye (10-14). Using software and exposures of the same scene metered between exposure for shadow detail to exposure for highlight detail and the range in between (see here for a much more detailed explanation and on how to go about creating a more natural version of the effect) a single image is produced capturing the entire range of luminosity values in the scene. There is a more technical and vastly more expensive way to create HDR using oversampled binary image sensors. Here is what Wikipedia has to say about that and for the rest of us, rest assured they will be coming to high end mobile phones in the near future. Some DSLR’s, CSC’s, Mobile Phones have an HDR facility built in, but this will almost certainly work with JPEG’s which have a more limited dynamic range than versions of RAW or Tiff. Handled carefully they can be effective, but as always there is the question of how much control is needed, required or is desired by the photographer. The camera processor and choice of jpeg format mean that certain assumptions have been made at the coding stage you do not have an input to. David left us in no doubt that, whereas process can be automated, shoot in RAW (preferably 16 bit, but 8 bit has got him some spectacular results). Your standard 8 bit image (as used in JEPGs and a lot of cameras shooting RAW) gives you 16.8 million colours (more than you can see) and 16 bit 281 trillion (far, far, far more than you can see). 16 bit gives you far more subtlety to play with, whereas 8 bit tends towards grouping colours into bands rather than representing them as subtle variations of colours. In a not particularly accurate but certainly useful way of looking at it we can say the difference is in the ability to reproduce shades, though the human optical processing system does vary from individual to individual. David asserts that 16 bit is the future and for those interested in HDR and, eventually, all photography, so now is a good time to start working in it as far as you can. But why bother if all we want is the picture that represents a decent looking image of the widest possible range? Well now this is the tricky bit and where its detractors get dismissive of the technique. Before we touch on that, and we can only really touch on it here for reasons of time, space and the need to preserve a semblance of sanity, we need to deal with that problematic idea that you can only make art through fine motor skills. We have treated with this before (27/11/14) so I am not going to go into it again, but part of the attraction of HDR is to make the photograph look more like a painting. OK this is a gross simplification, a minority point in a minority interest, but that does not undermine its validity. Photography’s inferiority complex has existed since print 1 frame 1 in the history of photography. Both are trying to make that emotional connection with the viewer. If that is absent it doesn’t matter how good the draughtsmanship, the image does not work. David made the point that it is, despite his determined advocacy of the technique, only ONE tool in the box, a very important point. We all have our favourite tools. He gave an estimate of about 3% of his own photography – and this coming from a man who needs 16 TB storage space in his computer system and a high end spec to match in terms of graphics and processors, memory and monitors. To give you an idea, that’s about 640,000 25mb raw images, if my maths is right, so 20,000 ish frames to make up his HDR section when full – with David spending up to 8 hours getting it right on each one! Slightly more involved than Justin Quinnell’s equipment needs, for sure, but they are two ways of making an artefact, two different ways of making a connection. The other 97% isn’t and that is the point. There is no technique that suits all horses on all courses but the more techniques a photographer can master the more complete that photographer will be. Not in pseudo competition with fine art, but in terms of their own personal development and capabilities. HDR has a role to play in getting emotion into an image, certainly it gets a reaction like no other photographic technique I have come across. That’s the art of photography. OK let’s not tot up the cost of the sort of system David is talking about, he is a very experienced photographer with deep roots in computing. Looked at that from that perspective it just puts the technique out of the range of most of our pockets in the club. HDR can be done on a laptop using programmes that aren’t Photoshop. David reckons that layers and blending, cloning and careful metering are the basics and they can be practiced in any number of ways. Indeed Photoshop isn’t fully 16 bit yet and the vast majority of monitors out there cannot handle 16 bit data and the ones that do will cost you about the equivalent of the average UK wage. Start in 8 bit and make your way up. Practice, practice, practice the basics. Be critical, seek criticism, put the feedback into your practice. The same points were made by the last speaker. So let’s come back to the Marmite question again. “Love it, hate it, you can’t ignore it”. That is simply not true. Looked at logically the vast majority of the British public remain in denial that Marmite is a big issue facing the United Kingdom. It’s a clever ruse to sell a strong tasting edible (or inedible depending on your view) spread. If a Marmite insurrection has sprung up then it has passed me by. HDR certainly provokes strong opinions, but in ten years time it may be a capability so ubiquitous in photographic equipment that we give it no thought, in exactly the same way as most people do with most Marmite questions. Depth of field may be going the same way, where the out of focus becomes a filter you apply. The technology has been around for a while, only now it’s electronic. Those that do tend to feel strongly about this sort of thing, feel very strongly indeed, how do you like Marmite? Your Picture Your Way – Architecture & Artistry. Bring an image or two on these themes and give us some insights on the who the what, the why, the where, the when and the how! Monday June 15th – peaking between 00:30 and 02:00 The Milky Way. “Just do it and let others sort out their problems with it”, was Justin Quinnell‘s advice to the club on Thursday night. Apparently the pinhole camera, admittedly a minority interest, is rather divisive. To artists it is science. To scientists it is art. By this division, apparently irreconcilable, a fascinating and deceptively simple technique for creating long term expressions of the passage of time and not a little mystery is largely disregarded. Links nicely with David Southwell’s definition of photography quoted in last week’s blog ,”An art supported by science”, which seems to square that circle, and, while we are on the topic, a conclusion from the blog before that, that we use tools as a means of controlling what we can in order to look for the art in the rest. Problems of the world solved we move on with this fascinating perspective. The effect is not new, that is to say, our knowledge of the effect is not new, though its use is contested. Aristotle (384-322 BC) knew of the pinhole effect. Justin has christened it “Aristotle’s Hole” and pointed out that it’s an effect in nature traceable over 5,000,000 years, possibly more. That isn’t an argument for Intelligent Design, at least not one I recognise, but it does show that as a species we seem to be constantly trying to catch up with the rest of nature. Justin had his audience hooked from the off and a gallop through the history of the pinhole, taking in pretty much everything from nature, a sieve and leaves (Aristotle’s implements of choice), mirrors, the camera obscura, ancient Greece, the Renaissance and modern times, certainly added to the evening. Did you know that there are pinhole glasses as well as pinhole cameras? You won’t be getting them on prescription any time soon though. So, just what is a pinhole camera? Well it’s an enclosed, dark space with a single, small, hole in it positioned so that light can enter through the hole. Light, as we know from previous blogs and those lessons in school science that we paid attention too, travels in straight lines. When it meets a surface it turns an angle and continues in straight lines. If there is a light sensitive material for those straight lines to bounce back off then an image can be fixed. If that material is translucent then it can, as long as a modicum of shade is preserved be used as a screen to view the live image on. Pretty straight forward (though you can make things as difficult for yourself as you wish). Use a mirror and you can project onto another surface, such as paper where you can trace over the image (as long as the light holds). This is a technique that has a long history, though the question of whether that is an honourable history is a provocation itself and goes to the very heart of the question of what should be called art, which I think rather nicely brings us back to where we started this post. Justin introduced us to some major practitioners, (of whom he is one), my favourite being where whole rooms have been turned into camera obscura’s and the results captured on video or stills photography. One day, maybe. The fact is the physical limits are well known and, as usual, the most limiting factor is the imagination of the photographer. Certainly his own projects have shown that thinking unconventionally doesn’t have to mean great expense. Maybe it’s simplicity works against it. At its’ most unadorned it requires the cooperation of others, a beer can or similar container, some gaffer tape, something with a point on to make a small hole, tin opener and a photographic medium. The idea’s of short and long exposures has to be adjusted. We are talking seconds/minutes not fractions of seconds for short exposures and months (if not years) for long ones. Interestingly – though I suppose quite obviously – there is no development involved. This is because it will go completely dark when you develop the image, or try to, if the fix hasn’t washed the image away. Instead digital comes to the rescue, either using a scanner or a camera – you could probably use your camera phone – and then the reverse option in an image editing application. The truly amazing thing is the latitude the paper negative yields, meaning that the image burning out is rarely, if ever, a problem. Justine was at a loss to explain why, but that does not prevent him from exploiting the phenomenon. All in all a fascinating evening and one which, maybe, the club could follow up with some practical work? 12th March – Tonight we’ll be answering many of the questions you submitted about photography back in January. The topics will cover all the more commonly asked questions as well as a few unusual ones. Join in the discussion afterwards. Entries for 3rd round of the Reflex Open Competition now due. Final submission for Banwell Photobattle, co-ordinate with Alison. Firstly a very special Reflex congratulations to Ruth on her Ruby Wedding Anniversary celebrated last Saturday with family and friends at the Pomphrey Hill Pavillion, home of the Carsons & Mangotsfield Cricket Club. 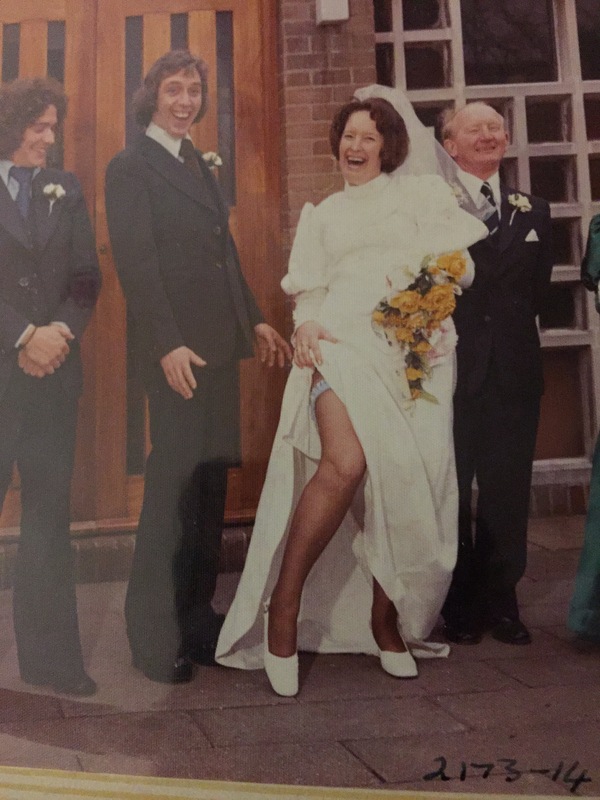 I admit I was ignorant of Ruth’s passion for the game until someone passed me this photo from her wedding day of Ruth appealing for an LBW. Secondly, well there is no secondly, how could you possibly follow that?